‘Put at its simplest, the financial support which the Charity has given to the Cathedral in recent years has enabled us to effect a whole programme of projects for which the finding of the necessary resources would otherwise have been at best a struggle and at worst impossible. Work done has included the repointing of the south and west sides of the (fifteenth-century) main tower of the Cathedral – a major undertaking – the refurbishment of the (Norman) Chapter House roof, the relaying with new tiles of the Chapter House floor, enhancement of digital equipment in the main and side naves, reinstallation of the Emergency Lighting within the Cathedral and its exterior premises following a critical Fire Inspection, and, during the next two years, a project to transform the Signage and Visitor Experience encountered by the many visitors to the building. 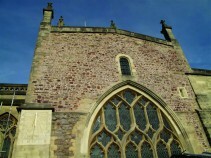 The state of the Cathedral’s fabric had been transformed as a result of the Charity’s support; and the Dean and Chapter are particularly grateful for the readiness with which the Trustees have permitted amendment of and revision to the project schedule over the grant period, in reflection of variable cost out-turns and the need to attend to legal compliance and other, sudden, imperatives’.